a place for ideas, electronics, prototyping, DIY technology, knowledge and arts. However, I don't want to promise anything, maybe this blog will have its own life and it will grow and develop the way it sees fit. Kickstarter released their numbers for 2014.While these numbers are amazing to look at and wonder about the worldwide impact of crowdfunding, I was interested in collecting some data related to the Arab world. UAE is at the lead, followed by Oman in terms of number of backers, and Saudi Arabia in terms of pledged USD. Only lately Kickstarter started allowing projects from a select few countries outside the US to run on its platform. Luckily Zoomal has been doing a great job as the leading crowdfunding platform in the Arab world, it would be interesting to see and compare how much money has been raised vs. spent in the Arab world on crowdfunded projects. I was always frustrated of how the hardware and the DIY community is still small in Lebanon. This keeps reminding me of how we are brought up into thinking that we are not made for it. It is just not meant to be: we are too busy with our social, political and economic problems that for some reason we forgot a big problem- we just don't make stuff anymore we consume. Obviously the community is there, it just need the right environment to grow. "Making Beirut v1.0" is the first actual gathering for the hardware maker community in Lebanon. 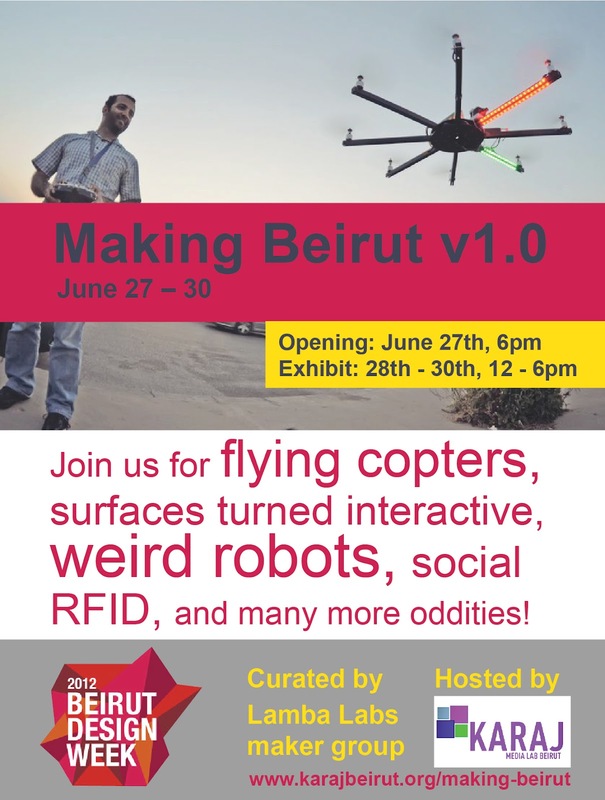 In my opinion, Beirut is not ready for a Maker Fair <yet>, however, and as the name of the exhibition suggests, we would like to promote the maker culture, spread the knowledge and gather the community so that v2.0 will be closer to the full deal. During four days many items will be exhibited. I, myself will be exhibiting a couple of items that can be found on my blog and elsewhere. And I can ensure the people attending the exhibition that they will also be an active part of the exhibition where they can play with robots, interact with tables, experiment with photography, and even play with electronics! So get your geeky spirit ready, and join the makers at karaj and learn how you can promote and meet a community that is hacking its way into the city as they want to see it. 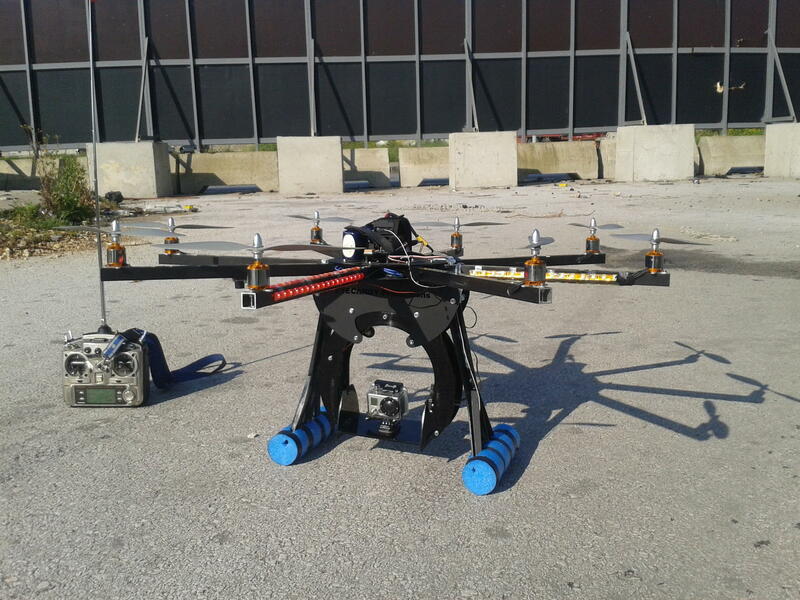 When one thinks about robot locomotion, the first thing that comes to mind are bipedal robots or mobile wheeled robots. This is not the case with Sevag Babikian. 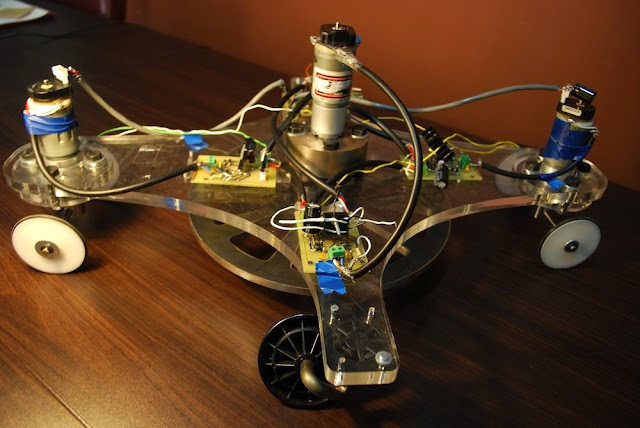 As part of a research done by the Mechanical Engineering department at the American University of Beirut, Sevag built a wheeled robot which motion is inspired from the snakeboard. He called it the ShakerBot. What is the ShakerBot made of? 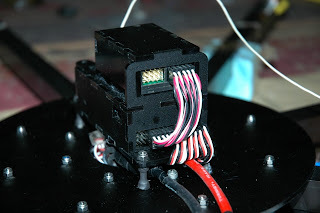 - A couple of DC motors (steering motors) on the front and back. These motors are called steering motors and they are connected to an axle which in turn is connected to friction wheels to guide the robot. 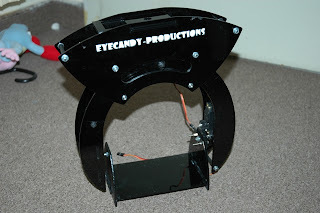 - A couple of castor wheels on both sides of the robot to support its weight. 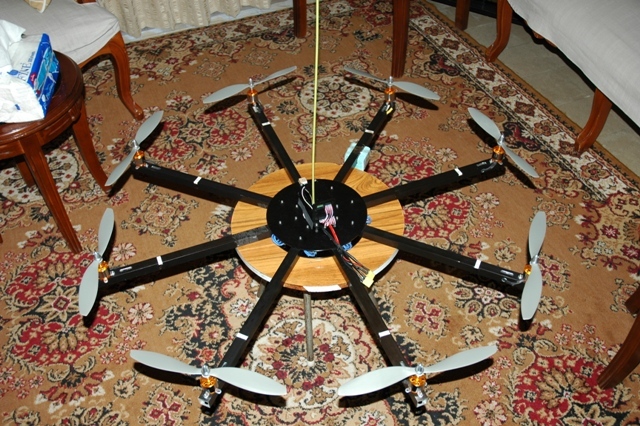 All the motors are connected to quadrature encoders to compute their instantaneous position and speed. 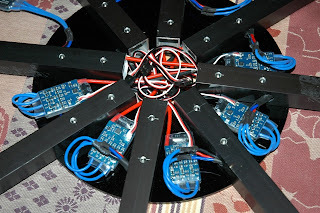 Each motor is driven using an L298 based motor driver circuit, capable of driving up to 4A continuously.The brain of the Shakerbot is an Arduino Mega board. 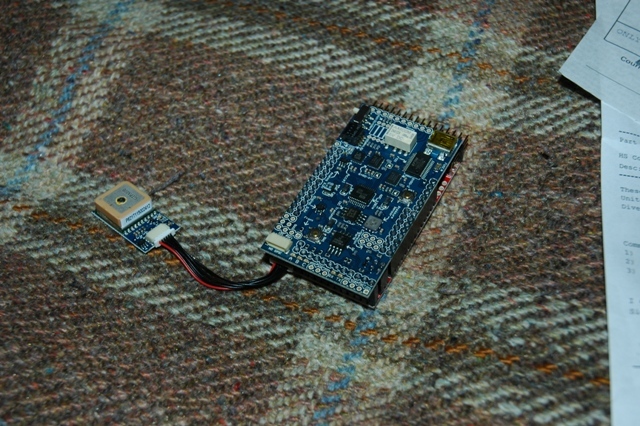 The Arduino Mega communicates wirelessly via bluetooth (ARF32 module) to a PC for teleoperation. So, how is motion generated on this ShakerBot? Have you ever seen a snakeboard? Or have you ever felt the urge to kneel on a rotating chair and start turning in order to experience the effects of inertia, or those of dizziness? Well, ShakerBot operates on the same principle. The flywheel generates momentum which drives the robot around. Steering motors, as well as the flywheel, move in a sinusoidal fashion. 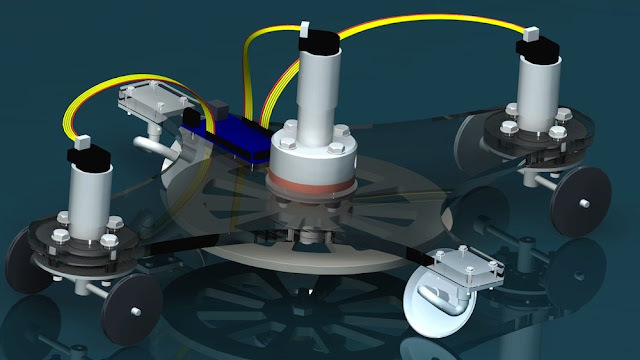 The motion pattern of the flywheel and of the steering motors are what generate the different robot motions (forward, backward, rotation, parallel park etc.). The mathematics are quite complicated and can be fully understood in this publication by Lewis A. et al (1993). The Arduino Mega board does all the complex mathematical and trigonometric equating and controls the DC motors accordingly. How does the ShakerBot communicate with the PC? As mentioned above, the computing is done on the Arduino Mega board. However, it is required to have a wireless connection with a PC in order to teleoperate the ShakerBOT and tell it where to go. 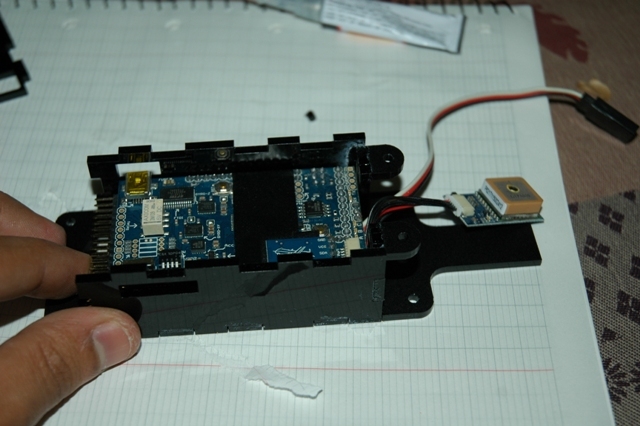 A couple of months ago I received a bluetooth module from Farnell electronics. It is the low cost ARF7044A based on the ARF32 bluetooth module manufactured by Adeunis (you can find it on the Farnell Electronics website). 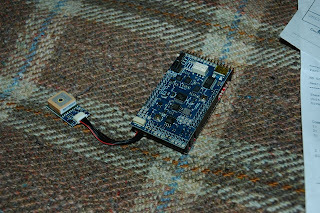 I decided to help Sevag out in implementing the bluetooth communication on the ShakerBot using this board. For 23£ I can tell you that this chip worked like a charm. We were able to achieve instantaneously a wireless communication, simply by wiring it to the serial Tx and Rx of the Arduino Mega and by connecting it to our laptop's bluetooth. I will be using more of this ARF7044 in the future and I will post whatever I find. On another note, for all the electronics makers, geeks and hackers out there, I discovered lately a website with a large community powered by Farnell electronics that you should check out. It is called element14. The easiest mechanism for robot locomotion is the differential drive mechanism. However if we look at humans we see that we use bipedalism very efficiently. We can walk, run and even climb with minimal energy consumption. This is because we make use of gravity to ease up the locomotion. 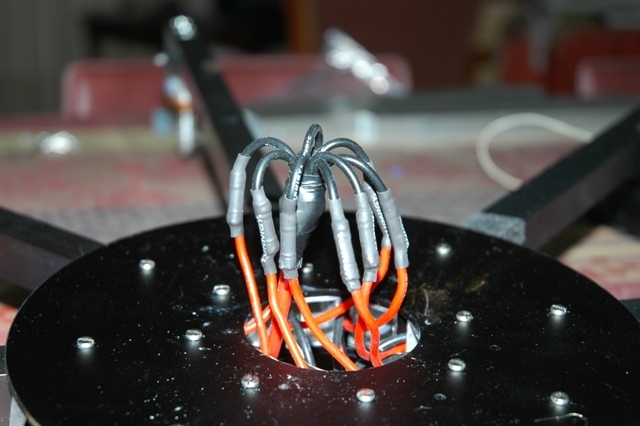 Up until now, every attempt to mimic human bipedalism on humanoid robot has been very inefficient. This might change as technology as we learn how to fully harbor the physics and dynamics of the system. Same thing can be thought about this ShakerBOT. Humans use snakeboard efficiently, they harbor the momentum generated by their bodies in order to propel. Maybe this ShakerBOT and after plenty of modifications and improvements will turn out to be an efficient locomotion method after all. 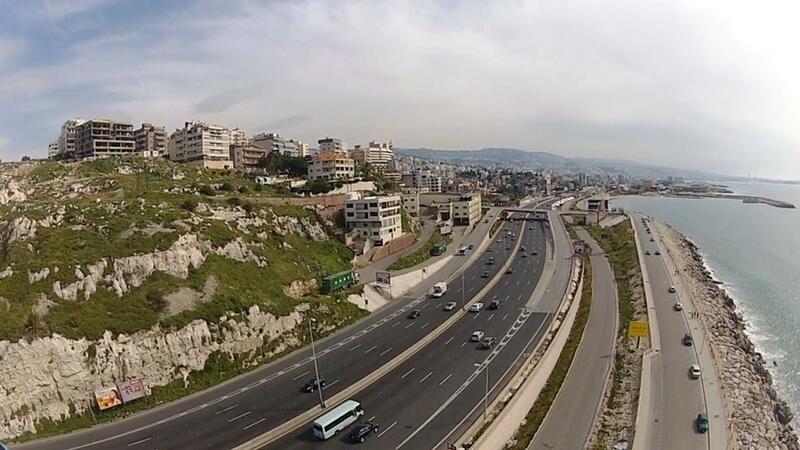 Finally, I am very excited to see the maker movement growing fast in Lebanon. 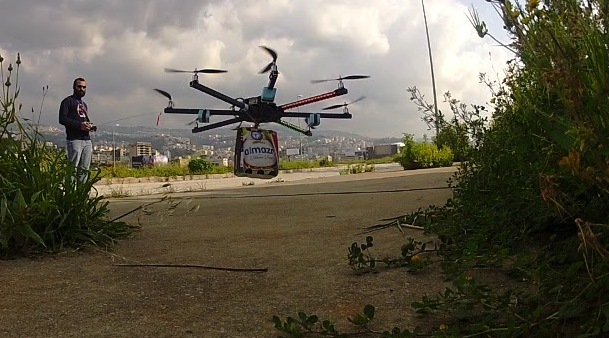 First Mounir and his Octocopter and now Sevag and his ShakerBOT. I can ensure you that there many more creative people just waiting to expose their work! I used 2cm * 2cm * 1 mm aluminum square tubes and the motors are from DIY drones with 35cm wires 2836/9. Each engine has a thrust of 1300g approximately. I designed and laser cut the case from a 3mm black plexiglass to hold both the Ardumega and the receiver. 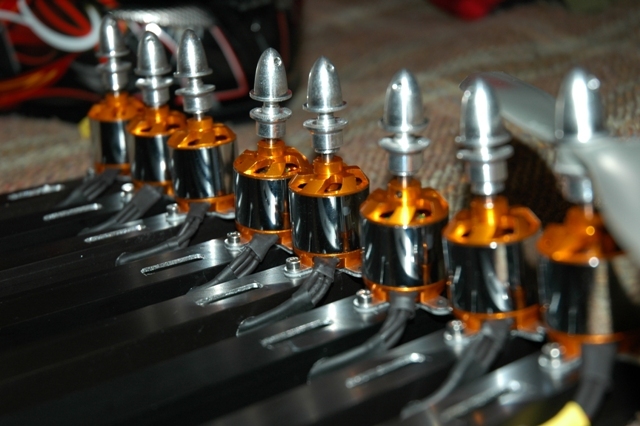 As for the motor controllers, I bought 8 25AMP Turnigy ESC's from HobbyKing. Ardumega will be responsible for the compensation on the roll/pitch axis at the moment. Later on, I will upgrade it to control all three axis. This is my camera gimbal. It currently has 2 active axis , but later on I will upgrade it to 3 axis. Currently I'm working on finalizing roll and pitch, but I am still waiting for the right parts to arrive. Wires from the ESC's to main power source are all well soldered and added heat shrink. I promise the next design will be more elegant. With the cash at hand and the time this is the best I was able to come up with. Here is the first video from the OCTO, of course it looks better now but this is just a sample. Feel free to ask me anything, your feedback is important to me. It better be a good one though! Lebanese electronics shops: the TSOP experience. Mr. Warhol here is my chance...15 minutes of fame can also be life changing.